Send in the next defendant! Make it a bad one, Ammit missed lunch. “The Book of the Dead!” All right, we know it’s really the “Book of Coming Forth By Day,” but BoTD has such a delicious gothy feel to it. It’s usually the only Egyptian book you can find in bookstores, and people get the idea that it’s the equivalent of the “bible.” It’s where you should go to learn what Egyptian religion is all about, right? People who try to read it are immediately immersed in a bog of weird spells and pronouncements. … words to live by! This entry is inspired by Sharon LaBorde’s Kemetic How-To Guide video “Understanding the Book of the Dead.” It’s 15 minutes long- take a look. 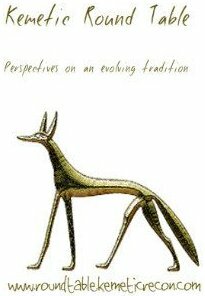 The Oriental Institute has a modern translation by Thomas George Allen available for free download. So… what in the world is it, really? Here’s what I think: The spells are what you’d take along if you were driving to some distant country that you knew a little about. You don’t have a direct way to research things, so you take along a collection of things you might want. Do they have stores with parts that will fit your car? Maybe not- better take a couple extra headlight bulbs, windshield wipers, a gas can, etc. You’ll take your phone or navigation device, but you better have paper maps in case something unexpected happens. You might get diverted to some other route because of construction or flooding. Maybe it snows there. How about tire chains, a little shovel, and an ice scraper? Are the traffic laws the same? If a policeman stops you, how do you behave? Take some energy bars and bottled water in case you can’t find a restaurant. You’d end up with a lot of miscellaneous information and baggage, much of which you might not need. But it’s good to have it just in case! Spell 36, for driving off a cockroach: “Keep away from me, lips of crookedness. 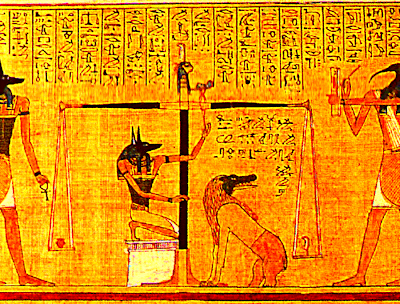 I am Khnum, lord of the Circuit, who brings the words of the gods to Re; I report the message to its lord.” In the Duat, it’s probably a twenty-seven-foot-long cockroach that sees you as a snack. But still… a spell to send the cockroach away. The whole thing is a pile of heka spells, and they vary depending on the concerns of the person buying them, or which edition you bought. There’s almost a “cheating” quality to some of the utterances. For instance, spell 30b is for a heart scarab, and it prevents your heart from confessing anything bad about you. Trials in this world sometimes go wrong, and even if you’re innocent it’s smart to have a lawyer on your side to make sure you don’t answer questions you shouldn’t. “And lo, make a scarab of nephride adorned with gold and put within a man’s breast, and perform for them the ceremony of the opening of the mouth, it being anointed with myrrh. To be said as a charm: My heart of my mother, my heart of my mother, my breast of my being, stand not against me as witness, oppose me not in the Council. Outweigh me not before the keeper of the balance. That brings us to spell 125, the Negative Confessions in the Hall of Double Ma’at. Some people attempt to construct a moral code from them, but they run the gamut from “I have not committed murder” to “I have not waded in water.” Either they ran out of serious ‘sins’ and started scraping the bottom of the barrel, or something else is going on. The 42 negative confessions sound like diversions to me. In grade school, you might have told the teacher that you cleaned the erasers, in hope that she wouldn’t ask about your homework. In a performance review at work, you’d list all your successes, and not mention the times you messed up. You don’t want the judges to go on a ‘fishing expedition’ of your life, so you tell each of them something that might relate to their concerns. That satisfies their requirement of examining you. “Hail to you, ye gods. I know you, I know your names. I shall not fall to your swords. Ye shall not report my wickedness to this god in whose train ye are. No affair of mine shall come before you. Ye shall not tell lies against me in the presence of the Lord of the Universe, because I have done what is right in Egypt. I have not reviled the God. No affair of mine has come before the King who was in his day.” I’ve told you all something, now keep your mouths shut about anything else. Do you find any of the spells especially inspiring? Are there any that seem especially weird to you? This entry was posted in Afterlife, Theology and tagged Book of the Dead, BoTD, Budge, Going Forth by Day, heka, Kemetic How-To Guide, LaBorde, Oriental Institute by helmsin2. Bookmark the permalink.